Amaze your loved one by gifting her this Ivory Frosted Kurti by W Lifestyle which she will simply love. 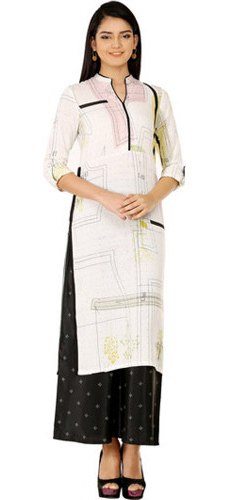 The self-design Kurti is created by W Lifestyle. The simple pattern, rolled-up 3/4th sleeves and mandarin collar appeal of this cotton-blend White Kurti makes this attire a true value for money.